It sounds like someone forgot to finish the sign... A sign that says that a sidewalk is to be closed "on or about" is probably meant to have someone write in the date "on or about" which the sidewalk is to be closed. In normal usage, the phrase "on or about" is followed by a date and has the same meaning as "approximately." 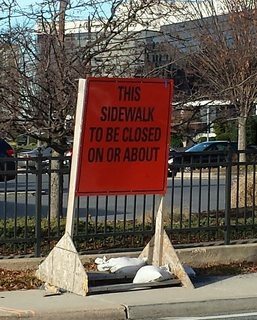 If a sign says that a sidewalk will be closed on or about January 5, 2014, I wouldn't be surprised if it were closed anytime between a few days before to a few days after January 5, 2014. The phrase has a more precise legal definition when used in legal documents. Not the answer you're looking for? Browse other questions tagged phrases legalese or ask your own question. What does “divided highway” written on a white regulatory sign mean? What does this phrase mean “ follows specific width requirements”?